When adapting a 400 page epic novel for the stage, you usually have about three options: 1) Make the play 6 hours long to cover all the ground in the source material; 2) Try to dutifully cram everything into a 2-3 hour long play; 3) Use the novel as inspiration, and rethink the story for the stage. Now, I haven’t read E. L. Doctorow’s 2005 novel The March, but my friend who also saw the show did, and she attests that Frank Galati’s 2 hour, 45 minute stage adaptation chose option 2. 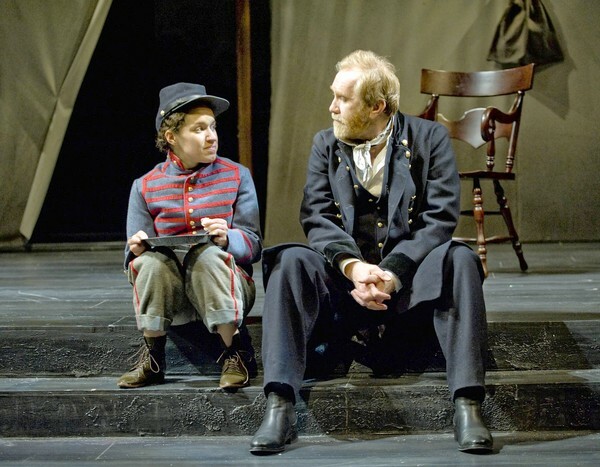 And from my perspective, this play, which covers the experiences of both real and fictional people during the Civil War, felt like a choppy, fractured first draft. Which is a pity, because the combination of Galati and Doctorow resulted in one of my favorite shows ever: Ragtime. But no such magic here. The March is supposedly (according to Steppenwolf marketing materials) about General William Tecumseh Sherman, who infamously marched 62,000 Union soldiers through Georgia, destroying everything in their path — a strategic tactic known as the “scorched earth policy.” So, I did my duty and read up on (wikied) General Sherman and his March prior to showtime. Fascinating stuff. But the play actually features little of Sherman (played with weary charm and unconventional command by Harry Groener). Instead, we’re taken to the periphery of the March to see the impact this landscape- and life-altering event had on various people. Fine. That’s a novel and potentially theatrical approach. However, Galati’s script is so heavy handed you rarely feel drawn into the trenches of this historical event. Instead, we get lots of actors standing in the spotlight and passively telling us about their experiences and feelings in stuffy and unconvincing speeches. And, for a company that prides itself in fierce ensemble work, the acting is all over the map — some are giving authentic, gritty performances (Groener as well as Ian Barford and Stephen Louis Grush as war comrades who flip sides depending on how the wind blows) while others come off as stylized, nearly characterized, archetypes. Explosions blast between scenes in a seeming attempt to ensure you’re at attention (not to mention awake) during Galati’s stagnant staging. James Schuette’s scorched scenic design gets the job done. Still, there are some thrilling moments throughout, mainly during Groener’s scenes, which again are few and far between.